“The main objective of a university is to provide an enriched learning opportunity for their students, not trying to make money off of a program,ˮ said a Junior in Ewha Womans University who asked for anonymity. An estimated 3,500 students and graduates gathered on campus on August 10, to fight for what they believe in; a university that thinks of the students first. The whole conflict started when Ewha Womans University President Choi Kyunghee announced that they were to undergo major changes that were needed to accompany the advent of their new education program, ʻLight Up Your Future in Ewha Womans Collegeʼ Program. The program originally aimed to offer bachelors degrees in new media, health, beauty and fashion to high school graduates and older working class women who didnʼt have the opportunity to receive a college education. It wasnʼt the program itself that exasperated many Ewha students; it was the way the administration pushed ahead with the program without incorporating or, at the very least, trying to listen to the students’ opinions. Even though the students have officially requested to meet with the President Choi to share their opinions on the ʻLife Projectʼ, their request was silenced and ignored. That and the fact that many students were already quite disappointed with the previous university policies that were severely infringing upon the student’s rights eventually sparked many protests and sit-ins that were to come. Some of these policies are, for example, the decision to eliminate the scholarship the school gives out to students who have a 3.5 GPA or above and the fact that the university decided to not open the library after hours during mid-terms and finals. The change entailed with the program was also another reason for students to fight against it. Many students fear that the quality of the education they will be able to receive will drop significantly if the school starts to “sell degrees to make profits.” They also did not favor the new construction that the university had to go through in order to accommodate the “stately funded college.ˮ Many students protest that they would rather see a new building that had places for students to study in, rather than a building that had another bundle of classrooms and a café to go with it. “We are not here to cause trouble. We are not radicals. We are just students who want to protect our place of learning from a selective number of professors and the President of Ewha, who all care more about money than the education of Ewha students,ˮ was one of the many slogans that drifted through the air during their protest. Like their slogan, even to this day many students are still protesting for change. The protest first originated as a sit-in starting on July 28. Things started to get physical when President Choi had called the police to oppress the situation on July 30. The physical oppression had stimulated the sit in to escalate to a significant protest. 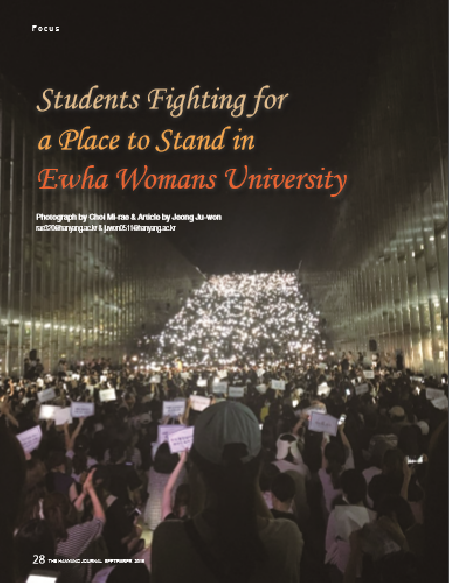 On August 5, the students of Ewha Womans University got together to hand in a petition to President Choi, but were turned away 24 minutes later without even any attempt to listen to what the students had to say.